After three years (1925-1928), KHQ had grown out of its two-room quarters in the Davenport Hotel and was looking to increase its transmitting power output. Early in 1928, it was announced that KHQ would move both its studios and transmitter to the Eilers Building. 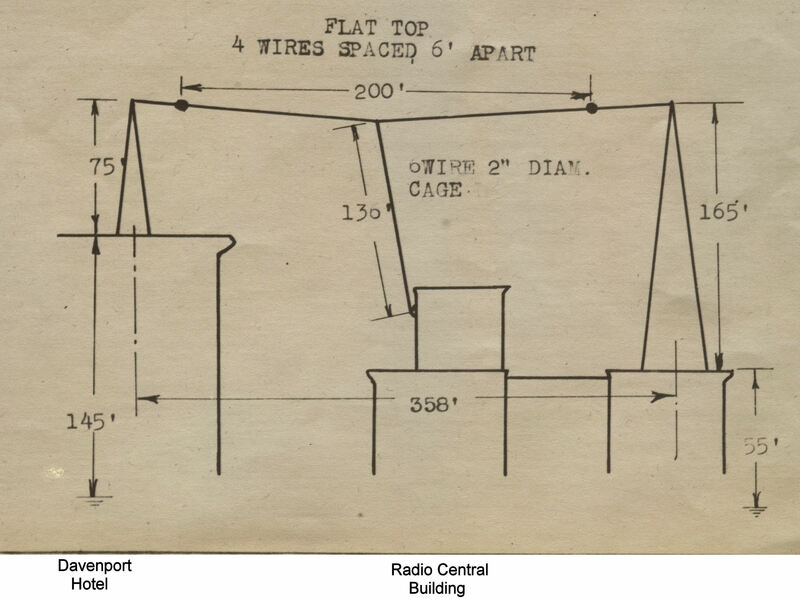 The antenna would now consist of two towers one on the roof on the east side of the Davenport Hotel, and the other on the west side of the Eilers Building. KHQ's licenses from the mid-1930's state that the antenna was a flat-top "T" type that was 200 feet long and 136 high, and that the towers were grounded. A Spokesman-Review article of 2 May 1928 stated that the transmitter was to be a Western Electric 106-A. According to the FCC records, KHQ installed a 5 kW Western Electric 105-C in 1930, a transmitter which was used at this site until KHQ moved to Moran Prairie in 1936. In late 1928, Louis Wamer planned to move the station's transmitter site to Greenacres, Washington to "provide farming coverage" to "a territory not served by other major stations." However, these plans never materialized and he continued to use the transmitter plant on top of the Radio Central Building. The Eilers Building was also known as the Standard Stock Building. The building was later called the Radio Central Building to reflect KHQ's and KGA's occupancy. The Radio Central Building was razed in 1971 and the Washington Trust Building, now standing in its place, was built. The tower erected on the Davenport Hotel was finally razed in the 1990's as part of a renovation of the hotel. September 1 has been set as the tentative date for the opening of the Greater KHQ studios on the seventh or top floor of the Eilers Building, it has been announced by Louis Wasmer, owner of the station. More than $50,000 will be spent on moving the main studios from the Davenport hotel and the transmitting station from the Peyton Building to the new quarters, also complete new Western Electric equipment known as the 106-A broadcasting Set. The new transmitter will be capable of putting out 5000 watts of power, but only 1000 will be used. The plans call for two 125-foot steel towers, one upon the roof of the Eilers Building, the other on the roof of the Davenport Building. The construction will allow an aerial 175 feet in length and a possible counterpoise, half that long. Architect Frederick Westcott in now drawing plans. The Eilers building space in now occupied with a photographic studio which has been given 30 days notice. Much of the broadcasting equipment is already here, according to Mr. Wasmer. A five-year lease has been signed and the total rent is said to be $21,000 for the period. S. J. Wilson is the owner of the building. 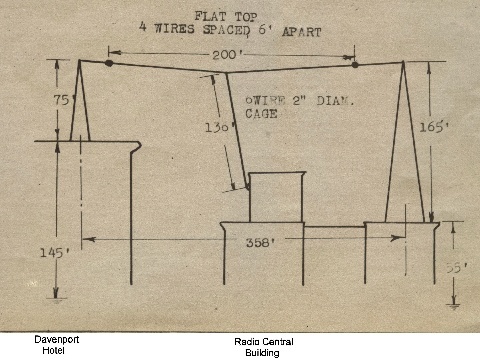 Schematic drawing by O. W. Towner of towers and antenna on top of the Davenport Hotel and the Radio Central Building. Application for Radio Station Construction Permit for KHQ, filed on 4 October 1928, Washington, DC. Found at the National Archives, College Park, Maryland. "KHQ Will Move Radio Studios." Spokesman-Review. Spokane, Washington. 2 May 1928. KHQ Radio Broadcasting Station Licenses from 1934 to 1937. Federal Communications Commission. Washington, DC. From the National Archives, College Park, Maryland. "Spokane Valley Site Chosen by Louis Wasmer of KHQ. Spokesman-Review. Spokane, Washington. 25 July 1928. Peyton Building - Web site for the Peyton Building.